This fall, our FPP missionaries traveled the world in weekly cycles. As always, we are happy to share our experiences and the results with you. 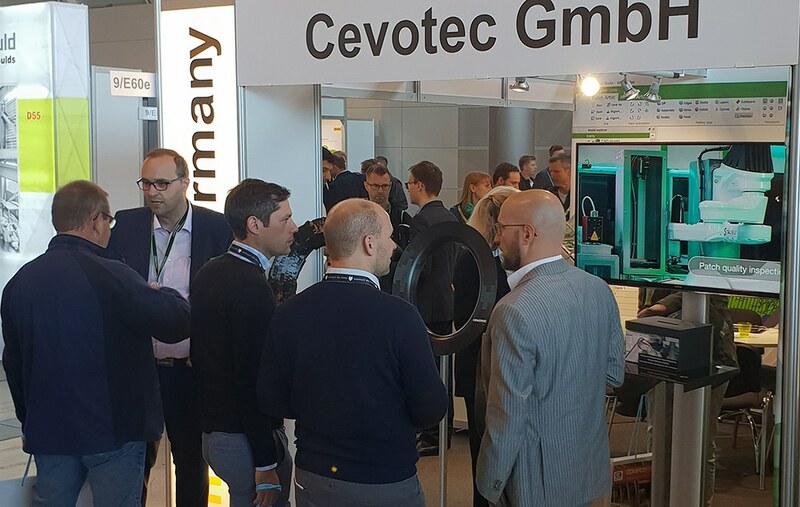 Our latest developments of Fiber Patch Placement convinced on exhibition areas and conferences of Advanced Engineering (Birmingham, UK), Composites Europe & ICC (Stuttgart, Germany), GoCarbonFibre (Berlin, Germany), and JEC Asia (Seoul, South Korea). 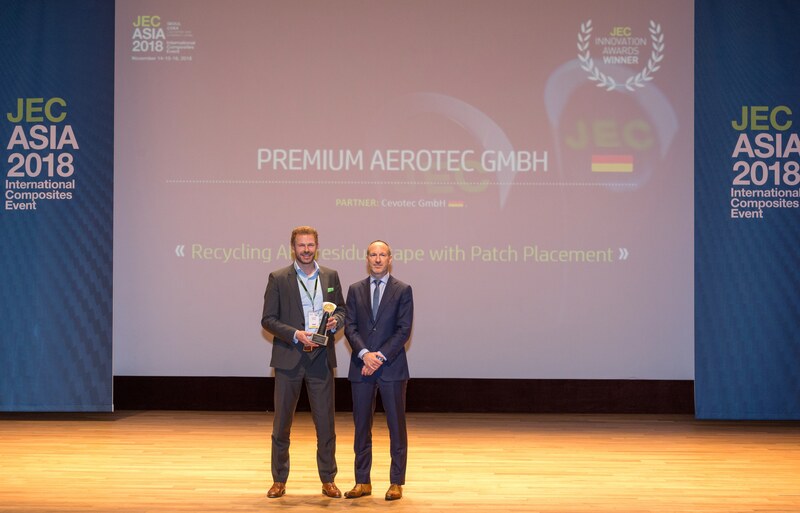 At Seoul, together with Premium Aerotec, we were honored with one of the most prestigious awards of composites industry, the JEC Award for sustainability. Of course, in this newsletter we report in detail about the awarded composite part. You also get to know more about Fiber Patch Placement as an industry 4.0 lightweight strategy for future airtaxi concepts. And – particularly as a manufacturer in aerospace – you will enjoy reading about a case study how FPP helps to realize significant recurring cost savings in AFP processes. Perhaps you will join our hands-on seminar on component development with Fiber Patch Placement in April 2019. We look forward to meeting you then! But now, as this is the last newsletter of 2018, we wish you a Christmas full of love, joy and peace. May this coming New Year bring you a spark of good fortune needed to complete all your endeavours successfully. As you may have read in JEC Magazine 122 and our last newsletter, we’ve been working together with Premium Aerotec on repurposing “left-over” tape material from AFP processes. In order to keep set-up times of AFP machines short, all reels of tape are simultaneously changed as soon as the tape left on one reel is not enough to place the next layer of the laminate. Consequently, manufacturers suffer from virgin tape scrap rates plus additional costs to dispose the material. Improving material utilization and reducing overall cost are basically the reasons why Premium Aerotec teamed up with us. As part of the BMBF-supported IMPLUS project, we not only validated the repurposing of the material, but also managed to produce a complex-shaped operating box cover, a component that was considered to be “impossible to automate” – but only until now. With SAMBA Prepreg production cells, adjusted for processing ½ inch wide thermoset prepreg tape, we effectively ‘recycle’ the residual AFP tape. SAMBA also enables us to manufacture the specific part that Premium Aerotec had in focus: a pressure cap with a complex, double-curved shape and a circumferential flange for rivets – so complex that regular fabrics could not be draped to achieve the desired geometry. In the past, Premium Aerotec examined different materials and processes to build this pressure cap, all of which resulted in high cost and a heavy part. Designing and manufacturing the OP-box with FPP technology, using the residual AFP tape, cut the part’s weight by 70%. The recurring costs could be decreased by 75% while the cost reduction including the repurposing effect of the material is equaling 88%. For these results, the partners Premium Aerotec and Cevotec received the JEC Innovation Award for sustainability in Seoul on November 15. We are definitely proud to be among the twelve winners from eight different countries and to receive this award together with Premium Aerotec. 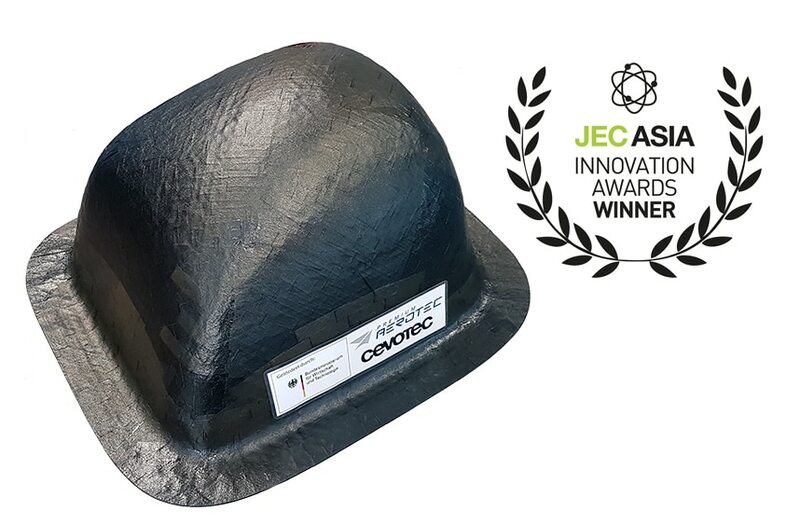 The JEC Innovation Awards highlight how composites open up solutions considering the new challenges in terms of efficiency, sustainability and product life-cycle. We recognize that this particular project is of special relevance as it demonstrates innovation not only on the component, but also on the process, effectively combining AFP and FPP technology to increase material efficiency, reduce cost and enable new applications. As it is he only technology able to master the challenges of this component, Fiber Patch Placement impressively demonstrates the potential it brings to the aerospace industry for manufacturing complex fiber lay-ups, now and in the future. Share this success with us – and download our case study on this project! It points out how FPP boosts material efficiency in AFP processes and shows how manufacturers of aerostructures can save significant recurring cost when combining FPP with AFP processes. Let’s look into the future and imagine riding air taxis like Bruce Willis did in The Fifth Element. What was utopia in 1997 will soon be reality (albeit in a slightly different format, as we suppose). But future mobility concepts pose a special challenge for manufacturers. 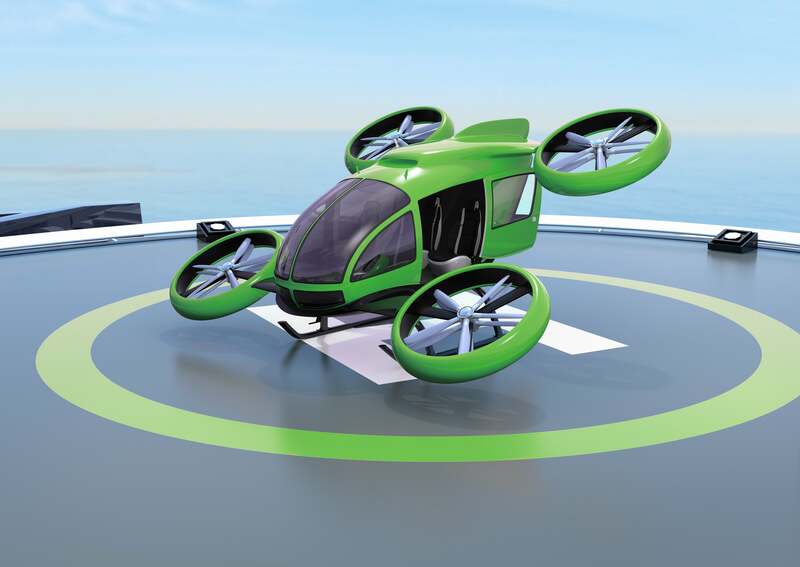 A new class of light aircrafts and flying-car hybrids is currently emerging, resulting in extreme demands for lightweight construction and scaling in order to maximize the range of their electric drives. Therefore, the industry needs new production concepts to make composite lightweight construction more efficient, cost-effective and scalable. Additive manufacturing with Fiber Patch Placement enables manufacturers to do just that. Learn more about Fiber Patch Placement (FPP) bridging the gap between productivity, flexibility and production costs in fiber composites and offering efficiency even at low volumes through scalable automation. When you are ready to take off, contact us for a personal consultation. Learn more about our SAMBA production systems or contact us for a personal consultation. On April 4, 2019, we organize a hands-on seminar in cooperation with AVK. The Seminar on Component development with Fiber Patch Placement takes place at Cevotec’s in Taufkirchen. After a detailed introduction to the technology the participants will work themselves with the ARTIST STUDIO software: They will virtually model a patch-based laminate and convert the result into machine data. Finally, the “dancing robots” of the SAMBA Pro production system will produce the laminate live on site. Register for the seminar directly on the AVK website. We are looking forward to meeting you at the following events and conferences. Of course, the JEC Award drew some attention. Check out`our press review of the last weeks. It was a pleasure to look back on the last months together with you. You think that information about Fiber Patch Placement is also relevant for your colleagues and business partners? Please do not hesitate to forward the newsletter – here’s the link to our subscription page. More information about products & services, press clippings or job offers can be found on our homepage.